I always thought a perfectly white pair of sneakers looked like a blank canvas. I found this pair for 5 dollars so it was a great opportunity to do some experimenting. I discovered a super simple way to embellish these. 1. A Pair of White Canvas Sneakers. 2. 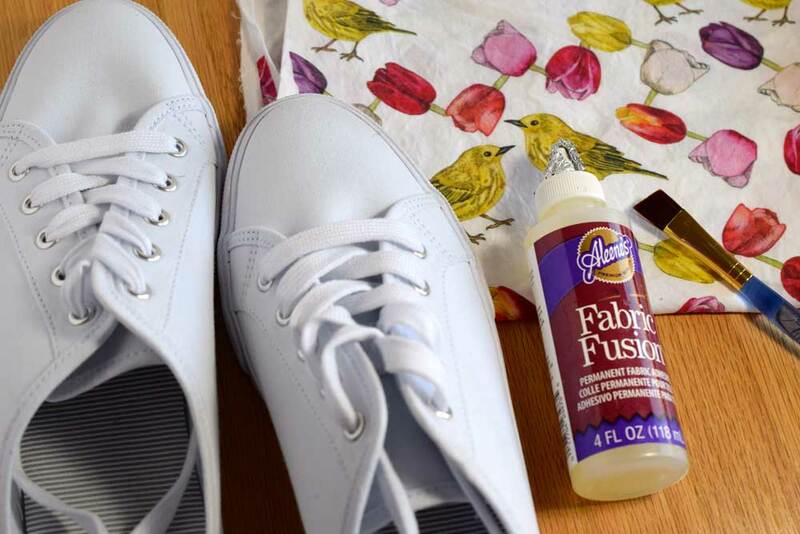 Fabric Glue (You could also use Mod Podge here as an alternative to the fabric glue). 5. Scissors or an exacto knife. 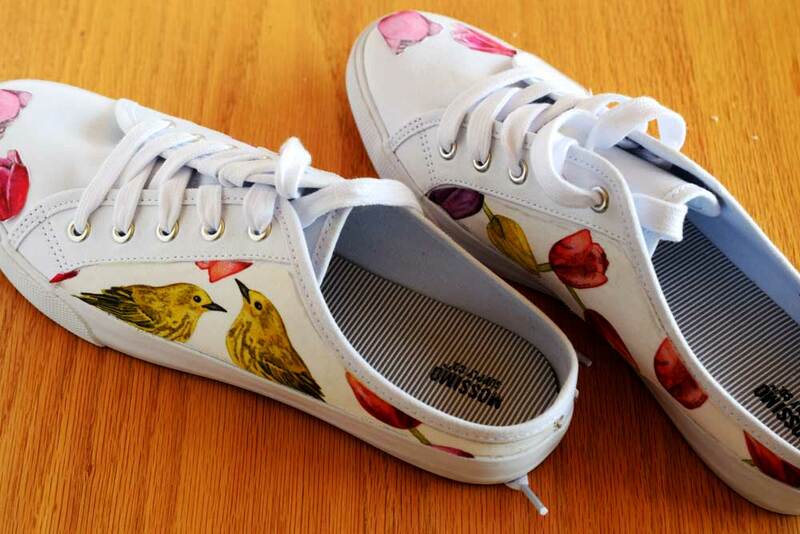 Pick a area on your shoe that you would like to decorate. The shoe has a natural seam which makes a great ledge and is a perfect area to apply the fabric. Next, choose what part of the fabric you want on the shoe. Choose something that has visual interest and a nice composition on the area you are choosing to work on. 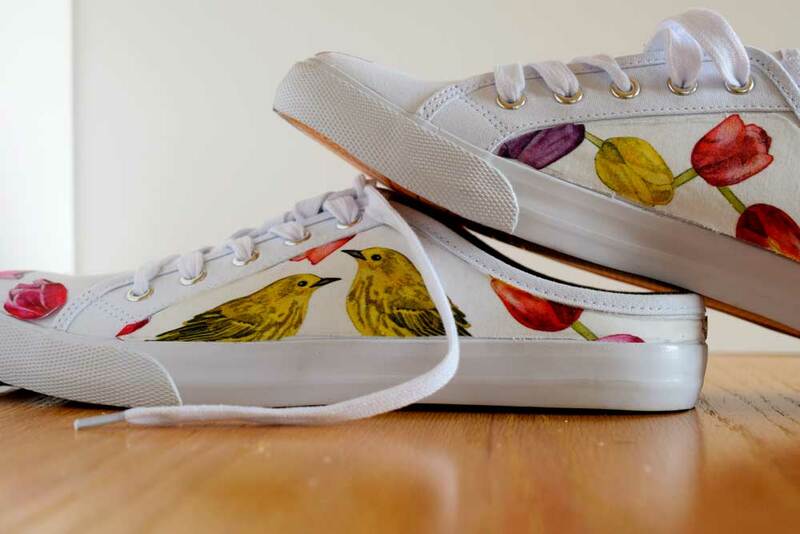 Once you have chosen an area on the shoe to work on and your fabric composition, apply a thin layer of glue to the shoe using an old paintbrush. As you can see in the above picture, the area between the seams provides a natural border for the fabric placement. Lay the fabric over the area you just applied the glue to. You have a chance to play with the placement a little before the glue start to take hold. Adjust the fabric where you want it and smooth any wrinkles out of it. I wanted both birdies so I played around with the fabric until I got them centered where I wanted them. I then smoothed all the wrinkles out up to where the seam ledge of the shoe was. Let your glue dry (Check the drying time on your glue bottle to see how long). I have to admit I jumped right in while the glue was still damp and it made the cutting more difficult. Using the seam as my guide, I used an exacto knife and carefully cut the fabric. You have to be firm enough to cut the fabric but gentle enough not to cut into the shoe. Tricky business. In this method, you simply place the area of fabric you would like to use over the area you wish to cover on the shoe. Use the seams to draw a light pencil outline. Use sharp fabric scissors to cut out the shape. 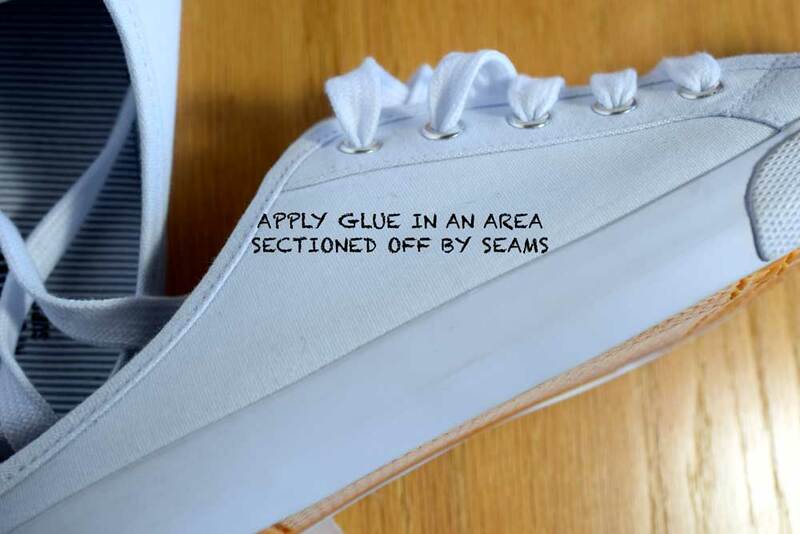 Now apply glue to the area on the shoe you wish to cover and adjust the fabric piece you just cut onto the glue, being sure to smooth out any wrinkles. Let the glue dry according to the instructions on the bottle. I like that they have a hand painted look. What I like about method number one (the exacto knife) is that you can really get a more precise fit but it is a lot more labor intensive. Method number two (the pencil tracing method) is really quick and easy, if a little less exact. 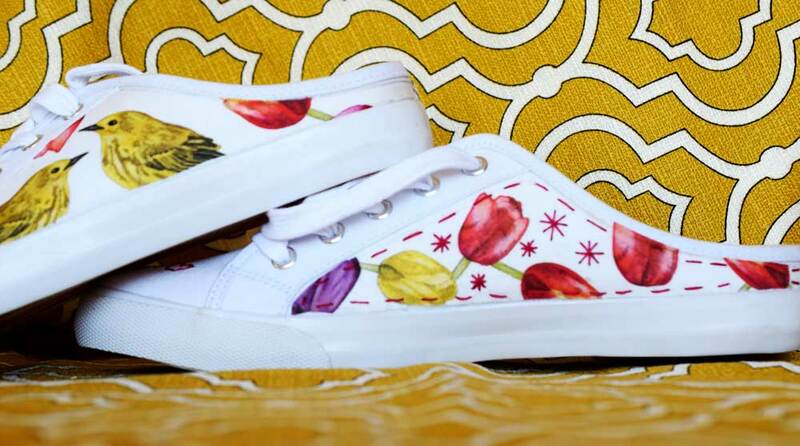 For the flowers on the tip of the shoe, I cut out each flower individually and glued it on. That is another easy thing to do if you do not feel like fitting fabric pieces into designated sections but I think the pieces look really nice. You don't have to stop there. Feel free to add some embellishment such as embroidery. If you do decide to try your hand at embroidery make sure you get a thick needle meant for heavy fabrics like canvas or denim. This design used the straight/running stitch. If you are interested you can learn how to make this stitch HERE. In includes a free printable to practice on. If you like the fabric used in this tutorial it can be found at my Spoonflower shop HERE.